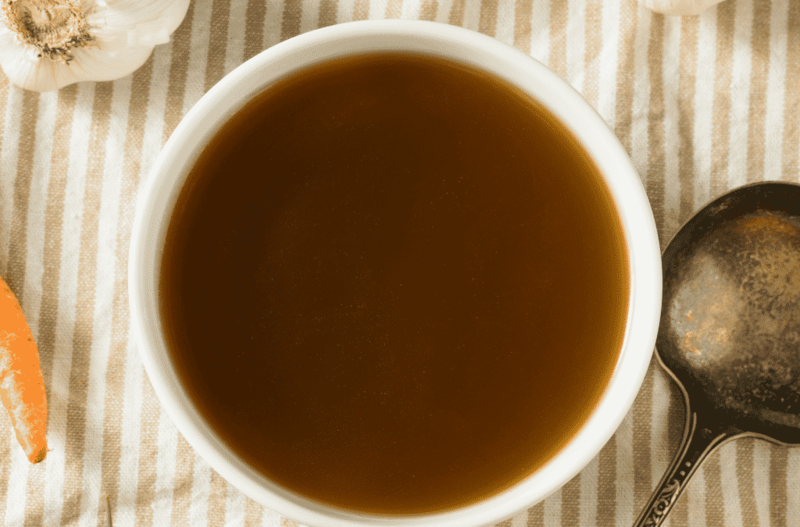 Here is the beef bone broth recipe I promised you last week. I really did simmer it as low as possible on the stove for three days. The result was amazing—not quite as amazing as chef Ron’s—but still quite impressive. Dr. Sheehan even helped me out prepping the mirepoix and all the other little tidbits that get added. By now, we have eaten the broth almost completely up. I think I have about a cup left, plus some fat. I’m using the fat as a cooking fat. I’m feeling like it’s soon time to make a chicken bone broth. So stay tuned for that. Season bones with ample amount of salt & pepper, roast on a large baking tray at 425 degrees until golden brown, turning bones as necessary. Remove bones to large 5 gallon stainless pot, roast vegetables and aromatics in same pan with all residual fat, season again with salt and pepper. When vegetables begin to caramelize, add tomato paste and combine thoroughly, continue to roast until fat is totally emulsified and tomato paste begins to brown. Add wine to pan and deglaze for a minute or 2, then scrape all vegetables, liquid and accumulated browned bits from the bottom of the pan into stock pot with the roasted bones. Cover bones and vegetables with 2 inches of cold filtered water and the tamari, season again with salt and a handful of peppercorns. Cover pot with tight fitting lid, bring to a boil over high heat, then reduce to a low, barely bubbling simmer. Cook for at least 2-3 days without boiling - the level of liquid should gradually reduce by a few inches over this time. Strain out all contents of the pot into a colander lined with cheesecloth when a rich beef flavor has been achieved and all marrow has gone out of the bones. Reduce strained stock if desired, or allow it to cool in glass mason jars, with an even distribution of fat then refrigerate. After the stock has chilled overnight there will be significant fat cap accumulated at the top of the jar, leave this on until ready to use as it will preserve the stock. Freeze any remaining stock that won’t be used within 2 weeks. The stock can be simply heated and taken as a tea, clarified and chilled as a consomme, used to saute vegetables, make a quick soup, the base of a risotto, reduced with additional wine and butter as a sauce, among many other applications. If you try this recipe, let me know how you do!